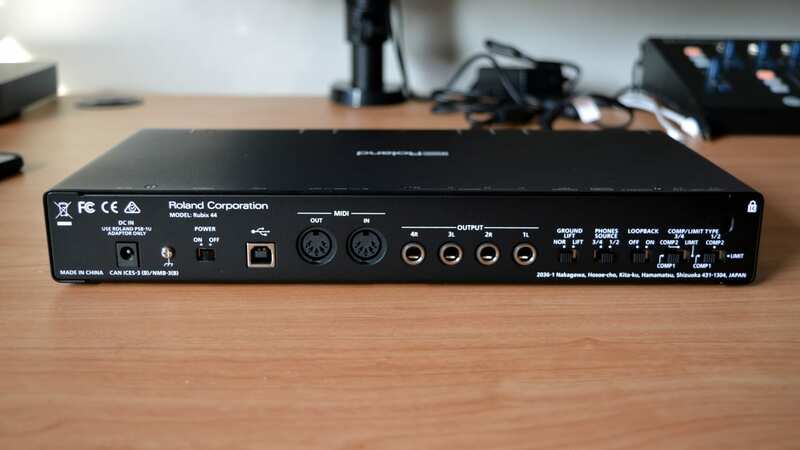 Roland may not be the first name you think of when you think of an audio interface — instead, you probably think of the likes of PreSonus, Focusrite, or others. 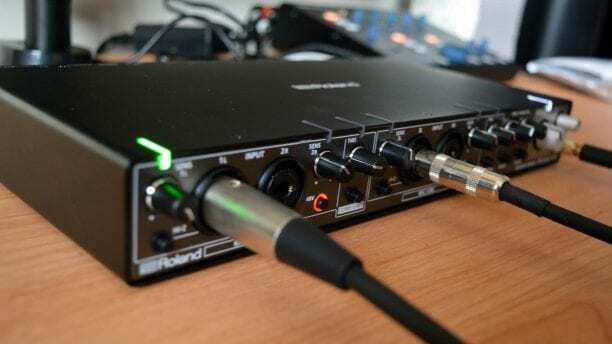 Roland, however, wants to change that — and to that end, the company recently took the wraps off of its latest audio interface, the Roland Rubix 44. Of course, Roland has an uphill battle ahead of it. While it’s one of the leading companies in the world of electronic drums, keyboards and electric pianos, and so on, it may not necessarily have as much expertise in the world of audio interfaces. Can it take on the recording heavy-hitters? We put the Roland Rubix 44 to the test to find out. As with any new product, the first thing you’ll notice about the Roland Rubix 44 is its design, and it’s not a bad-looking device. On the front, you’ll find the four mic/line inputs, along with gain knobs for each one and phantom power controls for each pair of inputs. You’ll also find monitoring controls and a headphone jack. Perhaps more interesting, however, is the fact that the interface has an on-board compressor, allowing you to temper your input a little before recording it to your DAW. On the back, you’ll get two pairs of outputs, a MIDI input and output, and switches for ground lifts, headphones source, and compressor type. It’s not an ugly interface, but it’s not overly interesting in design either. The interface should look right at home in any home or small studio without drawing too much attention to itself — but we think that’s a good thing. Many prefer a subtle look to their devices anyway. Plus, where it counts, Roland has down a great job — there are nice stainless steel accents, a generally sleek look, and the interface is labelled well, making it easy to quickly find what you need. On the front and top of the interface, you’ll also find indicator lights for input and the compressor. The Roland Rubix 44 is a little larger than some other so-called “portable” interfaces, but the trade-off is some nice features. The device comes in at 12.25-inches wide, 6.5-inches deep, and 1.8-inches tall. Even more important than look is build quality, and the Roland Rubix 44 seems built like a brick. It’s solid and built from metal, and where there is plastic, the plastic is clearly strong and able to handle any abuse that you might throw at it in day-to-day use. That’s good news when it comes to an interface this size — especially considering the fact that it’s an interface you might take on the road with you for field recordings. Perhaps more important that the design of the interface is its sound, and thankfully it’s a good-sounding device. All four inputs are capable of of recording audio at 24-bit and 192kHz, which most people won’t ever need to take advantage of anyway — and that makes for a generally detailed and clear sound. In general, we found that the sound quality of the Roland to be quite good. Sure, you’re not getting the quality of converters you would expect from a much more expensive device, but overall we found that the preamps and converters in the Rubix 44 were definitely comparable to other interfaces in this price range. As mentioned, the Rubix 44 features a built in compressor and limiter, and it’s a nice addition. Once again, the sound-quality here is very subtle — you may not want to opt for the built-in compressor when you’re doing a mix down but for ducking a vocal a little while recording, or ensuring that you don’t clip, it did perfectly fine. It wasn’t too over the top either — you won’t get much of a pumping sound unless you really bring the threshold down. This is probably the main feature that sets the Roland Rubix 44 apart from other devices in this price range — most others simply don’t have built-in compression features. The compressor actually has two modes, with the first being super light and the second being a little heavier. Then there’s a limiter mode, which obviously could just be described as the compressor in an even heavier sound. 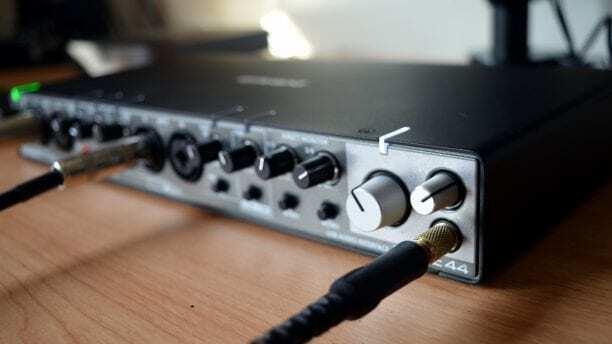 Overall, however, the compressor doesn’t do a lot of lifting — it’s there if you need it, but leaving it engaged in case of a clip won’t affect your overall sound that much. We find that to be a good thing. The Roland Rubix 44 is an excellent option for home studio users who like the idea of a built-in compressor and four channel inputs. In fact, it’s probably one of the best choices out there for those people. 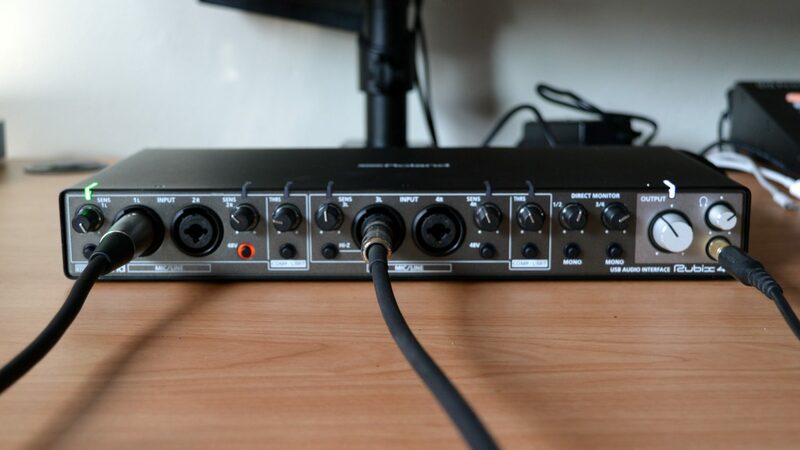 Sure, there are plenty of interfaces that have four inputs or more, but few of them are as inexpensive as this — and few of them offer other features, like a built-in compressor and MIDI ports — as well. Because of that, we recommend the Roland Rubix 44 to anyone looking for a four channel interface with a few extra features under $300.